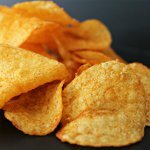 Potato chips were invented in Saratoga Springs on August 24, 1853. How come that we know the exact date? Everything is very simple. A tasty diner sent back his French fries to the chef of Moon Lake Lodge, Greoge Crum. He complained that his French fries were not sliced thin enough and were too soggy. Chef decided to fight back the customer, that is why he sliced the potato wafer-thin, fried in a boiling oil and over-salted it. Potato couldn't be eaten with fork without shattering. And no gentleman at that time could allow picking food from plate with his fingers. Surprisingly, Crums dish was rewarded with compliments to the chef. The customer loved his chips and other diners wanted the same dish. Thin and crispy potatoes appeared in the menu of Moon Lake Lodge as Saratoga Chips, house speciality. Soon chips were packaged and sold first locally, and then throughout New England territory. Choose Regular, Onion, Sour Cream or Barbecue as the U.S. most popular potato chips flavor to celebrate this holiday!